Inmesol presents its range of parallel generator sets, which enable the supply of large amounts of energy, on demand, either as a main supply or in stand-by supply in the event of a mains failure. The set has an electronic control module which, besides carrying out the full control of the set, also detects when the MAINS electric supply fails and controls the switching, by sending the command to start the set and closing the contactor which allows the flow of electrical energy from the set to the charge. When the mains electric returns, the set synchronises with it and the control module sends a signal to close the mains contactor, and the flow of energy starts through this. For a few seconds the 2 contactors (mains and set) are closed, decreasing the energy supplied by the set progressively, producing a RESTORATION OF THE MAINS WITHOUT CUTS, until the control module sends a signal to open the set’s contactor (the flow of energy generated by it is stopped) and then gives the stop command, leaving them once again in reserve position. This system is formed by various GENERATOR SETS, each of which is controlled by an electronic control module, with remote control and synchronization between those connected to a common bar. The control modules are programmed according to the load demand, establishing the optimum operation of each set. Electrical Supply Companies are sometimes interested in purchasing energy, in various circumstances; demand due to energy peaks, insufficient installation, to supply energy when the infrastructure is not yet ready. This system can be used to export energy to the Mains, if the Mains is connected to the common bar instead of the load. In this system the series of sets is in stand-by mode in the event of a mains failure. As in the previous case, each of the sets is controlled by a control module which allows all the system's sets to be synchronised and a switching panel with a single common exchange which jointly controls the MAINS’ load and the load of all the sets. The common exchange watches the MAINS. When a Mains failure is produced, it detects it, opens the MAINS contactor and sends a start-up signal to the sets. The sets are synchronised, their contactor is closed and they start to generate the energy demanded by the load, replacing the mains. The sets are adapted to the load, starting and stopping according to the demand. When the mains returns, the sets synchronise with it and the exchange sends a signal to close the mains contactor, and the flow of energy starts through this. For a few seconds the 2 contactors (mains and set) are closed, decreasing the energy supplied by the sets progressively, producing a RESTORATION OF THE MAINS WITHOUT CUTS, until the common exchange sends a signal to open the set’s contactor (the flow of energy generated by the sets is stopped) and then gives the command to stop them, leaving them once again in reserve position. 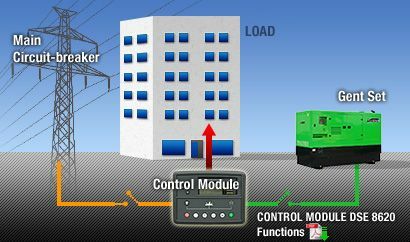 SYSTEM OF MULTIPLE STAND-BY GENERATOR SETS WITHOUT PARALLEL TO THE MAINS. The series of sets have their own control unit which enables their synchronisation, as well as controlling and measuring all the electrical parameters, alarms, etc., and any other mains control device useful to an installation in which it does not matter if a cut is produced when the mains is restored. This case offers various possibilities which can be used in various applications (according to needs), to control the action of the sets and detect the failure of the mains when this occurs; manual selectors, motorised thermomagnetic switches, any automatic control unit, etc.